Hailing from Duluth, Minnesota, Trampled by Turtles was initially formed by frontman Dave Simonett as a side project in 2003. At the time, Simonett had lost most of his music gear to some enterprising car thieves who'd ransacked his vehicle while he played a show with his previous band. Left with nothing more than an acoustic guitar, he began piecing together a new band, this time taking inspiration from bluegrass, folk, and other genres that didn't rely on amplification. Simonett hadn't played any bluegrass music before, and he filled his lineup with other newcomers to the genre, including fiddler Ryan Young, bassist Tim Saxhaug, mandolinist Erik Berry and banjo player Dave Carroll, the group began carving out a fast, frenetic sound that owed as much to rock & roll as bluegrass. Pigeonholing Blackberry Smoke has never been easy. Since emerging from Atlanta in the early 2000s, the quintet—vocalist/lead guitarist Charlie Starr, guitarist/vocalist Paul Jackson, bassist/vocalist Richard Turner, drummer Brit Turner and keyboardist Brandon Still—has become known for a singular sound indebted to classic rock, blues, country and folk. This fluidity has paid off handsomely, in the form of two Billboard chart-topping country albums, 2015's Holding All The Roses and 2016's Like An Arrow. (For good measure, the latter also topped Billboard's Americana/Folk album chart.) Find A Light, Blackberry Smoke's sixth studio album, doubles down on diversity. Songs hew toward easygoing roots-rock and Southern rock stomps, as well as stripped-down acoustic numbers and bruising alt-country. Rich instrumental flourishes—keening fiddle, solemn organ and bar-band piano boogie—add further depth and resonance. The Record Company is singer/guitarist Chris Vos, bassist Alex Stiff and drummer Marc Cazorla. Their story is well known: a trio of musicians grit it out on their own for years, join forces in LA, set up some microphones in a living room, and cut 2016's Give It Back To You. The album spawned three Top Ten hits, earned the band a slew of sold-out headline dates and festival appearances around the world, and garnered a Grammy nomination. On the group's latest album, All Of This Life, the gritty slide guitar, fuzzed-out bass, and driving drums are all still front and center, but the songs are bolder and more ambitious, brimming with adventurous vitality while remaining firmly tethered to the roots of American rock and roll. “We want to be known as the best live band on Earth,” says Cazorla, “and the only way to do that is to believe it and do it." 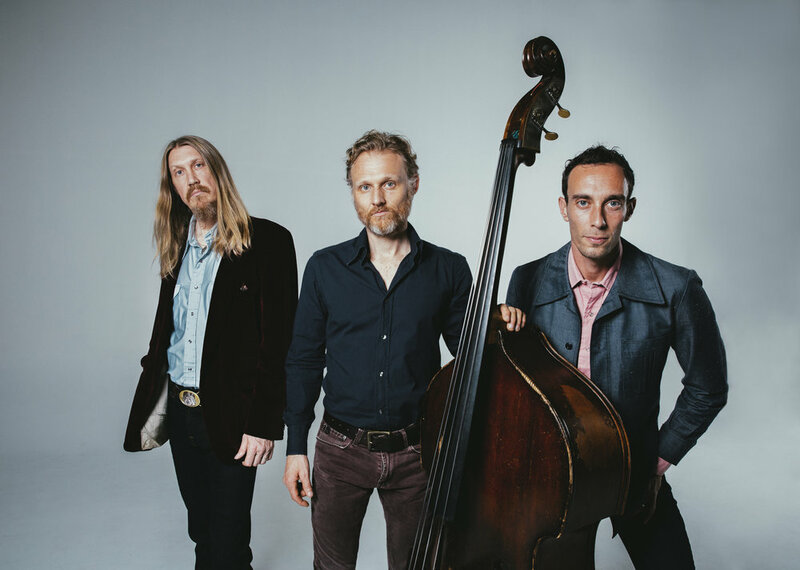 Dubbed "masters of soulful folk" by Paste, 2019 Grammy nominees The Wood Brothers formed after brothers Chris and Oliver Wood pursued separate musical careers for 15 years; Chris with Medeski Martin & Wood, while Oliver toured with Tinsley Ellis and his own band King Johnson. With drummer Jano Rix added as a third member, it's become quite clear that The Wood Brothers is indeed the main act. In early 2018, The Wood Brothers released their 6th album, and most dynamic recording to date, One Drop of Truth. “It’s the freest album we’ve done, the most independent album we’ve done, and was the most fun we’ve ever had making a record,” says Oliver. The Wood Brothers evolution finds three musicians being true to themselves. Raised in Birmingham, Alabama, lead singer Paul Janeway’s fearless showmanship, thoughtful lyrics, and dedication to his performance became St. Paul & the Broken Bones calling card after forming in 2012 and releasing their first album in 2014. Paired together with some of the best young instrumentalists in the South, the 8-piece line-up soon became widely praised as a soul-based rock unit, and a must-see event. Early on the band opened for The Rolling Stones and also had appearances on all the late night TV talk shows and Austin City Limits. The band’s new album, Young Sick Camellia, has created a space for St. Paul & The Broken Bones to rival any forward-thinking band making music today, based on a concept all-too familiar to him: family, and how we love them despite our differences. Josh Ritter is a songwriter from Moscow, Idaho. He was named one of the 100 greatest living songwriters by Paste Magazine, alongside Bob Dylan, Bruce Springsteen, and Neil Young. Joan Baez and Bob Weir have covered his songs, and he regularly sells out legendary venues such as the Fillmore, the Beacon Theatre, and London's Shepherd's Bush Empire. His newest record, Fever Breaks, will be released this spring. It was recorded in Nashville and produced by Jason Isbell, with the 400 Unit as the studio band. Actress Mary-Louise Parker once wrote in Esquire Magazine that "If you love music and have a device on which to play it, you should listen to Josh Ritter.” . Michael is a wounded warrior who found his voice while serving in Iraq, when he was pulled from the frontlines to write songs for the fallen. Tanya is a lifelong artist, drawn to singing’s power to take another’s pain away. Satsang is a power trio that puts forth a unique blend of soul, folk-rock, and hip-hop featuring lyrics that come from and are rooted in change, growth, awareness, and imperfection. Their live shows are everything the band’s name suggests: gatherings of people where truths are assimilated and shared. The rhythms keep everyone on their feet, and the lyrics leave them craving active and positive change. Satsang has toured all over the country and has shared the stage with the likes of Michael Franti & Spearhead, Steel Pulse, Nahko and Medicine for the People, Trevor Hall, Chris Berry, and many more. Dwayne (Dopsie) Rubin hails from one of the most influential Zydeco families in the world. Although inspired by tradition, Dwayne has developed his own high energy style that defies existing stereotypes and blazes a refreshingly distinct path for 21st century Zydeco music. This singer/songwriter and accordionist has performed all over the world since debuting his band, Dwayne Dopsie and the Zydeco Hellraisers, at age 19. Not only has Dwayne’s band mastered zydeco music, they also add a bit of rhythm and blues, funk, rock and roll, reggae and pop to their performances. Dwayne doesn’t confine himself to the stage; he interacts with the crowd, blurring the barrier between performer and audience. His ability to capture the imagination, heart and soul of his audience makes Dwayne one of today’s most dynamic performers. 2018 Grammy Nominee, Best Regional Roots Music Album. The Dusty Pockets tell meaningful stories, delivered with grit, wrapped in beautiful melodies and driven by powerful grooves. Their self-invented genre, “recreational Americana,” is indicative of the band’s mission to make seriously good music and have fun at the same time. Their debut release, Hard Line, is a ten-song album that cherry-picks from the band's wide and growing catalog of original songs. Centered on a strong foundation of American musical traditions, the band's output showcases a collection of tunes that scratch the itch for twang, soul, and rock'n'roll all at once. The Dusty Pockets are vocalist/guitarist Dave Walther, guitarist Matt Rogers, keyboardist Garret Rhinard, bassist/vocalist John Alex Griffith, and drummer/vocalist Joe Sheehan.